"A great day out — and we were certainly not disgraced!" That was the verdict at the front of Sonstrust bus no.1 after Dumbarton's 1-0 defeat by premier elite side Aberdeen in the quarter-final of the William Hill Scottish Cup. The Sonstrust organised four buses and the Sons YDI another one as over 660 Sons fans made the trip north to join 10,000 Dons fans. What a noise they made in support of their team. From the outset Ian Murray's looked determined to prove that part-timers can take on full-timers, and they had several chances in a goal-less first half. Chris Kane, Colin Nish and Mitch Megginson all had good chances, while at the other end keeper Stephen Grindlay was at his best. By the interval the natives were becoming distinctly restless as the skilful probing passes from internationalist Barry Robson and Willo Flood did not lead to a goal. A few minutes into the second half the Dons at last scored through recent signing Adam Rooney, who headed home a corner which Scott Linton had conceded unnecessarily. Sons fought back. Scott Agnew had a great shot well saved by keeper Jamie Langfield, who had early dropped a simple cross but was bailed out by man of the match Russell Anderson. Sub Garry Fleming came close with a header, and it was by no means one way traffic towards keeper Grindlay. With just moment remaining full back Paul McGinn could have levelled the score, but his downward header from a Fleming cross bounced up and over the bar. 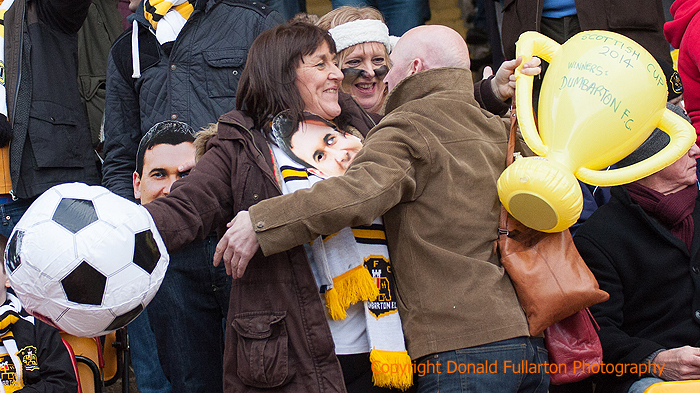 The picture shows fans Gilli Brough and Robbi Docherty enjoying the occasion.